Mike Reilly is back on the slate which means he is in play! He is the best quarterback in the CFL and draws the best matchup in Montreal who has allowed the most points to opponents so far this season. Montreal is allowing opposing quarterbacks to complete 67% of passes which is the second highest in the CFL. The only thing that might deter you away from playing him is his price and that the game could get out of hand early, but this is about as full proof as it could get in terms of a matchup. 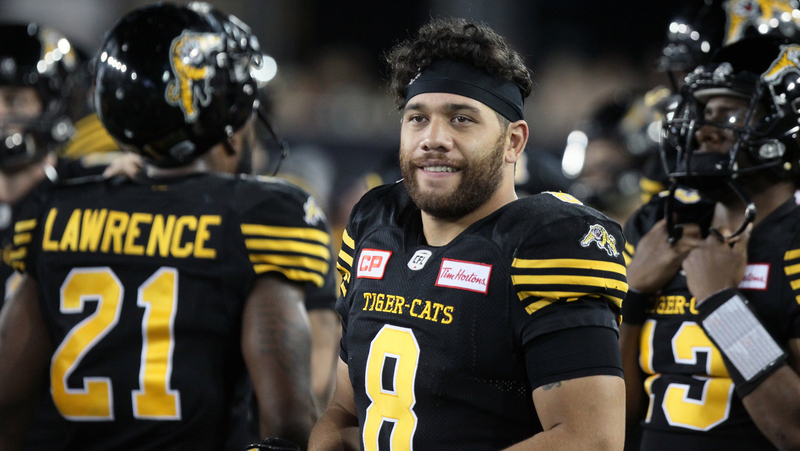 Jeremiah Masoli had a poor outing last week against Saskatchewan, but I don’t think that will be the case this week. Ottawa has been struggling of late defending the pass and opposing quarterbacks have been averaging 285 and close to 2 touchdowns over the last 3 games. Even Jeff Matthews from Montreal threw for 280 yards against this Redblacks defense! With the addition of Chris Williams, Masoli has the most lethal WR corps in the entire league and he should be able to move the ball with ease. Look to him to get back on track and start up a new streak of 300 yard passing performances. Masoli might be my favorite QB play of the week! I think Trevor Harris could be a good GPP play. He has looked great when his team is not matched up against Calgary. Harris tends to struggle when a strong pass rush is generated but luckily for him., Hamilton has only 7 sacks all season long which is in the lower half of the league. They have also only picked off a pass twice and are middle of the pack when it comes to pass knockdowns with 10. He could be a pick that goes under the radar this week. Andrew Harris proved me wrong so therefore, I am not going against him this week! He went off last week and was involved in all facets of the game against the Argonauts. He set a new personal best in terms of rushing yards for a single game and was also utilized in the passing attack as well. He is still under $9,000 which is something that we should be thankful for! William Powell is my other stud running back that I like this week. He has been consistent this season with getting double digit performances 4 out of 5 weeks and 2 of those being 20+ point weeks. Hamilton has the worst run defense in the league, allowing 139.2 yards on the ground to opponents so this is a great spot to use Powell. Tyrell Sutton is one of my favorite lower priced running back plays this week. I know it’s weird to say that I like an Alouette this week, but he has been a consistent back for most of the season. He is only priced at $6,700 and has seen double digit carries his last 3 starts. One thing that really gets me excited about using him is that he has had 16 receptions over his last 4 games which means they find ways to get him the ball. He could be a good salary saver this week which is what you will need! I also hope he goes lower owned since he plays on the worst team in the CFL. Christion Jones could serve as your value punt play for this week since he is only $3,600. He racks up the yardage on returns and was able to house one last week. He is currently in 2nd in both punt return, and kickoff return yardage and Calgary is 5th overall in the CFL regarding opponent’s kickoff return average. He does have big play ability if he gets a few solid blocks so definitely look his way if needing salary relief. Duke Williams is finally priced as the best WR since he has been performing like it! In the past 2 games, he was looked at 34 times! This becomes an automatic lock play for me. Derel Walker has been quiet lately and with Duke emerging as the #1 target in this offense, I am not sure Walker is the reliable target we were once accustomed to. Stafford is a good play if you are needing a lower price point wide receiver this week and want exposure to this offense. The only Alouette that I would have some interest in is BJ Cunningham. I really don’t plan on rolling out too many Alouettes this week, but he has been at the tops of the Montreal target board with 31 on the season so that is something to consider. He could be a low owned tournament play that could pay off. Darvin Adams is in a real solid spot and he has been building rapport with Nichols in this Blue Bombers offense. He has seen 24 targets over the past 3 weeks which is leading the team. In just this same matchup, Adams had 6 catches for 82 yards and a TD, so I think he is a safe play in both cash games and even has some tournament upside. From the Argonauts side, this is where I will find my favorite WR value play. I was on Rodney Smith last week and I will be on him again this week. He led Toronto in receiving yards and he can be a very tough cover with his size. He will be a great compliment to SJ Green in this offense, so I think we will see Rodney featured more in this offense in the coming weeks. Hamilton is absolutely loaded with the addition of Chris Williams which makes this a tough spot since the targets could be spread out. I am not sure if Williams will be playing so we will have to check for updates on that as the week progresses. Brandon Banks was held in check this past week so if you are wanting a cheaper option than Duke but have similar upside, he could be your guy. The only other Hamilton receiver I truly like is Jalen Saunders. He has been very consistent in terms of targets and has been looked at 28 times over the last 3 games. These numbers standout to me and can offer excellent value if needing a piece of the Hamilton offense. For the Redblacks, I’ll go back to the Ellingson well this week. He burnt me badly this past week, but I think his lack of production was due to the pocket collapsing and Harris just needing to dump the ball off to Sinopoli on those little crossing routes. We also see a nice discount in price so that even piques my interest even more! I know a lot of people will be on Calgary this weekend since they are the best team in the league, but I will be off most of them! If I did look at a Stampeder, Eric Rogers is the one guy that I would look to fit in my lineup. He is seeing a high number of targets and the yardage is there every week. The only knock against him would be this current price he is at now. On the Roughriders side of the ball, Roosevelt has been a big play threat for them, getting a 20+ yard catch in each of the last 3 games. His price at $7,000 is a little on the pricey side for the lack of consistency in fantasy production so he might be a boom or bust tournament play. The WR I really am interested in for SSK is Duron Carter. He got switched over to DB earlier this season and has been playing strictly on the defensive side of the ball, but reports came out this week that he has been practicing on offense this week as well. Hopefully, we will find out more information as the weekend progresses and if I hear he will be a starting WR, I will be extremely interested in him at his price which is just $4,700. Calgary and Winnipeg will be very chalky defenses this week. For me personally, I will not be playing either and I will be going against the grain this week. The defense that has really grabbed my attention is Saskatchewan. They are $4,100 so they offer a lot of salary relief, but they have been a very consistent fantasy defense. At home, they are averaging 13.33 fantasy points per game and their worst performance came in week 2 and they still found a way to score 7 DK points. They have also hit double digits 3 out of 5 weeks so they have a legit defense. The Vegas total for this game is the lowest on the weekend, set at 47.5 so that is good to hear if you plan on playing either defense from this game.